“National literature is now a rather unmeaning term; the epoch of world literature is at hand, and everyone must strive to hasten its approach,” wrote Johann Wolfgang von Goethe in 1827, thus coining a term that has gained renewed currency in literary studies today (qtd in Damrosch 1). Today, the resurgence of world or global literature amidst the broader experience of globalization at the turn of the twenty-first century continues to be viewed as coterminous with the end of the nation or, conversely, the beginning of post-nationalism. But what notion of time is at stake in viewing history as the approach of one epoch signaling the end of another? What concept of world is meant in world literature? Vilashini Cooppan’s Worlds Within: National Narratives and Global Connections in Postcolonial Writing addresses these questions and challenges the treatment of the nation and globe as mutually exclusive. A complex and compelling work, Worlds Within challenges its readers to rethink prevailing logics of space and time that inform the production of literary history. Offering an account of the history of the postcolonial novel, Cooppan sees the nation not as a concept made irrelevant by globality, but a constantly mutating form that persists through and alongside the global. Interrogating the logics of space and time implicit in the narrative of globalization and post-nationalism, Cooppan proposes a rethinking of the ontology of nation. Rather than viewing the nation simply as a sociopolitical entity that has been distended by forces of global capital, Worlds Within draws from psychoanalysis and deconstruction, and treats the nation both as a psychic object and structure of desire. “Nations,” Cooppan argues, “are fantasmatic objects knotted together by ambivalent forces of desire, identification, memory, and forgetting, even as they simultaneously move within, across, and beyond a series of spatial and temporal borders (us/them, territory/flow, present/past, life/death)” (xvii). Citing Jean Laplanche and Jean-Bertrand Pontalis’ definition, the fantasmatic is a structure or schema for the subject that governs aspects of the unconscious life to produce fantasies, dreams, repetition compulsions and other forms of imaginary life. Constituting the liminal space of the psyche, the fantasmatic is a zone of indeterminacy that consists of multiple temporalities in that it perpetually reaches to the past to facilitate the process of becoming subject. The workings of desire reveal a more complex temporality at work in the narrative of nation that complicates a view of history that would treat nationalism and globalization as simply one era succeeding another. All national subjects live their nationalism in the mode of loss for all must contend with the difficult process of identifying with something that is not entirely there, that exists in the present yet recedes into the deep past of national history, and that seems to promise future inclusion but constantly works by present exclusion (32). However, Cooppan’s thinking of the nation as fantasmatic and of narratives of national identification through psychoanalytic modes of movement is less interested in elaborating the contents or a universal narrative of the nation than it is in tracking the mutating form of the nation without presuming a linear teleological understanding of history. Hence, she supplements psychoanalysis with Jacques Derrida’s notion of spectrality in order to articulate a mode of being that is both present and absent, located in the now and the not yet, on the inside yet outside. Spectrality designates a mode of being—what Derrida calls a hauntology—that is always open to the other, a capacity to affect and be affected, a condition that renders it at once vulnerable to iterability or alterity. With the emphasis on form, Cooppan applies a spectral method in analyzing genre and narrative, arguing that a mutual haunting of nation and globe can be detected in the history of the postcolonial novel. It should be noted that Cooppan’s appropriation of spectrality goes against Derrida’s insistence that the nation cannot be considered spectral because it is an ontopology, “the territorialized discourse of place rendered synonymous with being,” a bounded entity that constitutes itself by excising its Other (17). She cites Pheng Cheah’s critique of Derrida in Spectral Nationality, who argues that the nation, particularly its postcolonial forms, is arguably the example par excellence of spectrality of our time given that its existence is simultaneously threatened and reinvigorated by an uneven capitalist world system. Although similar to Cheah’s, Cooppan’s argument pursues a different direction, foregrounding instead the psychic life of the nation. Significantly, this produces an account of the nation that is not determined solely by flows of global capital and that is able to think through the nonlinear, entanglements of time in psychic life alongside the forward-driven movement of history. In doing so, Cooppan challenges the dominant focus on the bildungsroman in studies of postcolonial literature, which often corresponds to thinking the novel simply as a form originating in the West and disseminated to the rest, a historical narrative that corresponds with the linear plot of the rise of the nation in Europe, its subsequent spread elsewhere and demise following the onslaught of globalization. Guided by the ethical impulse to recognize the postcolonial Other on its own terms, Cooppan looks for patterns of recursivity and non-linear modes of time expressed in literary form to trouble the temporal logic that locates nationalism and globalization as sequential processes. Cooppan begins with a reading of Salman Rushdie’s Midnight’s Children. Widely read as a critique of the postcolonial national project of India and its communalist tendencies, Rushdie’s novel, with its playful admixture of multiple English and Indian languages, is often viewed as exemplary of a cosmopolitan form. Cooppan, however, argues that its denouncement of the nation as deathly and deadly is simultaneously an expression of a desire for an “ideal India,” made apparent by the novel’s persistent return to memory as a site of conjuring the nation in the wake of state-sanctioned violence. Cooppan takes the recurring return to a national past despite Midnight’s Children’s “aggressively global form” as a model to analyze the relationship between Joseph Conrad’s Heart of Darkness and its subsequent postcolonial transculturations in the works of Chinua Achebe, V. S. Naipaul and David Dabydeen (53). Using Freud’s theory of the fetish as a masterplot, Cooppan reads Conrad’s obsession with racial difference as a disavowal of the imperial nation’s civilizing mission and logic of progressivism. More significantly, she diagnoses a similar fetishistic structure at work in the constant return to Heart of Darkness in postcolonial fiction, not one that merely replays a tragic past in derivative fashion, but that repeats it with a difference. The result is an “uncanny effect,” the recuperation of a colonial text to write a past that opens itself to the yet unfinished story of the postcolonial nation (96). The consideration of W. E. B. Du Bois in Chapter Three, especially in light of the nearly century-long period that his work spans, implicitly frames the United States as both a postcolonial and an imperial nation. In this chapter, Cooppan tracks an allegorical mode persisting throughout Du Bois’ long writing career, from his famous essays to his lesser known novels. Engaging the work of Walter Benjamin, Paul de Man, and Frederic Jameson, Cooppan elaborates allegory as a form that expresses spectrality. “Allegory,” she writes, “marks the presence of a kind of time in which the past outlives itself, a time that demands the subject return to the past as it surges into, and becomes contemporaneous with, the present” (117). To crudely summarize a complex and theoretically inspired reading of Du Bois, Cooppan’s attention to form and the psychic plots of fantasy, melancholia and mourning produces an understanding of the relationship between nation and race, and race and gender that complicates the bildung arc of evolutionary progress that structures prevailing narratives of and beyond nation. Moreover, the trajectory of Du Bois’ thinking on race suggests an understanding of the nation-globe relation as inter-implicated rather than antithetical, a point that crystallizes in his later works of historical fiction. For Du Bois, Cooppan argues, the novel form is a means of resolving the tensions of national-global politics, exploiting the allegorical form of the historical novel to stage memory as the condition of holding on to, yet simultaneously moving on from the past. Similarly, Chapter Four, a study of the changing temporal logic throughout Frantz Fanon’s oeuvre, picks up where Du Bois ends—the anticipation of third world decolonization and the significance he hoped it would have for African Americans—and clearly shows us that the onslaught of neocolonialism on the decolonizing world renders the post- in postcolonial as perpetually nascent. Placing Fanon in conversation with Derrida’s Specters of Marx, Cooppan argues that the former’s work is a model of fantasmatic nationalism, one that incorporates the globe within the nation, restoring cosmopolitanism to nationalism albeit in a melancholic form—a reading that brings new relevance to Fanon’s work in the contemporary moment of globalization. In Chapter Five, Cooppan argues that Fanon’s ghostly form lives on in the works of post-independence African novels, namely the works of Ngugi wa Thiong’o, Assia Djebar, Tsitisi Dangarembga, and J. M. Coetzee, among others, presenting the novel form as exemplary in capturing the multi-temporal, multi-sited, heteroglossic experience of postcoloniality. Whether straining against the constraints of national representation, recalling histories knotted in the bodies of the nation’s racialized and gendered subjects or yearning for a nation that is otherwise to the neocolonial enterprise inherited from a dismantled empire, the novels constitute an archive that exceeds history even as it attempts to imagine another possible future for the nation. This model of a fantasmatic nation form is contrasted with a reading of Severo Sarduy’s Cobra, a novel mourning the loss of nation through parody and gender queer performance. Its national politics are decidedly different from those of Fanon. Sarduy’s novel not only departs from Fanon’s belief in the emancipatory promise of the nation; its staging of gender-crossing also troubles the implicit gendering of nation as female in Du Bois and Fanon’s works. Cobra serves as an interesting turn in the trajectory of Cooppan’s argument insofar as it poses the question as to whether loss is necessarily the same as lack, and whether the Lacanian psychoanalysis with which it engages is at all translatable to Latin America. 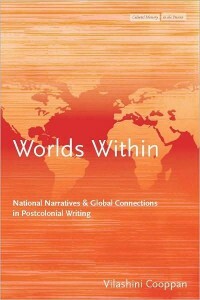 Grappling with this persistent question of meaning-making, Cooppan concludes that the seemingly oppositional national and global frames that guide literary analysis essentially boil down to a question of relationality between nation and globe, of how the two mutually constitute yet also deconstruct one another and how the distinction between them opens up a productive space for contemplating postcoloniality. Cooppan’s book demonstrates that psychoanalytic theory remains a vital tool in discerning the multiple and entangled temporalities at work in the history of postcoloniality. Ever attentive to its colonial roots and imperial impulses, Cooppan’s use of psychoanalysis guards against pathologizing racialized, gendered and queer postcolonial subjects as suffering from a psychic malaise. Instead, treating psychoanalysis as a means of detecting and inhabiting particular literary forms, Cooppan offers a novel look at the novel, her refreshing readings of familiar texts in unfamiliar contexts itself produces an uncanny effect that she also finds at work in the texts she reads. Put another way, Cooppan’s spectral reading demonstrates a new method of literary analysis: while attentive to the histories that haunt a text, this analysis is also attuned to new and unexpected ways that the text responds to ghosts from its past. Cheah, Pheng. Spectral Nationality: Passages of Freedom from Kant to Postcolonial Literatures of Liberation. New York: Columbia UP, 2003. Print. Fiona Lee is a PhD Candidate in English at City University of New York at The Graduate Center and an Instructional Technology Fellow at Macaulay Honors College. She is currently working on her dissertation, which examines the late-twentieth century fiction of Malaysia, Singapore and Indonesia as a means of thinking through the relationship between nationalism and globalization.